ACTSI’s Pediatrics program, in collaboration with the Clinical Research Network and Children's Healthcare of Atlanta (Children’s), support a Clinical Research Site located on the Children's at Egleston campus. 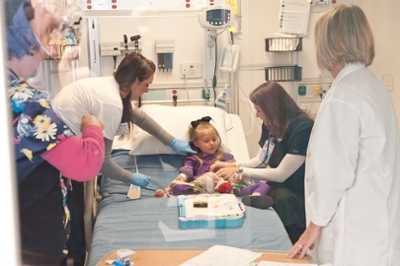 The Pediatric Clinical Research Unit is designed to provide the necessary infrastructure for investigators conducting pediatric clinical research. The unit was recently named a Pfizer Pediatric Center of Excellence. Only the second in the U.S., this distinction is in conjunction with the Emory Department of Pediatrics and Children’s. The only other Center of Excellence is located at the Cincinnati Children’s Medical Center. Congratulations!